Overall, remittances to Spanish-speaking Latin America countries have more than doubled since 2000 in real dollars. Those Latin American nations received $22.9 billion in remittances in 2000, a figure that rose to an estimated $53.8 billion in 2013, according to World Bank data. Looking at trends since 2000, the onset of the U.S. Great Recession interrupted what had been a steady upward trend from 2000 to 2007. Remittances to the 17 nations that are the focus of this report peaked at $61.6 billion in 2007, and then fell in each of the following three years, to $52.6 billion in 2010. Remittances rose in 2011 to $54.2 billion, but decreased to $53.7 billion in 2012 and held steady at an estimated $53.8 billion in 2013. Thus, in 2013, overall remittances to Latin America were 13% short of their 2007 peak. 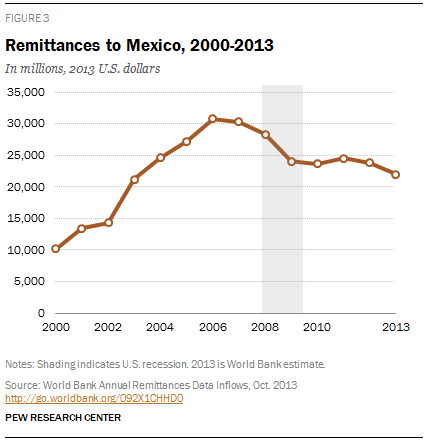 A decline in remittances to Mexico was the main reason for the overall decrease after 2011. Overall remittances to Mexico—nearly all of which come from the U.S.—are estimated to total $22 billion in 2013, according to the World Bank, compared with $10.2 billion in 2000. Remittances to Mexico peaked at $30.8 billion in 2006, a year earlier than for Latin America as a whole. Aside from a single-year increase in 2011, remittances to Mexico have decreased each year since then. The reduced remittances to Mexico were reflected in the findings of a 2008 survey by the Pew Research Center’s Hispanic Trends Project. Among Hispanic immigrants who had sent remittances in the previous two years, 71% said they sent less in the past year than the year before (Lopez, Livingston and Kochhar, 2009). In addition, immigration from Mexico has declined to the point that the number of Mexicans arriving in the U.S. could be smaller than the number who are leaving (Passel, Cohn and Gonzalez-Barrera, 2012). The next four sub-sections look at trends from 2000 to 2013 for 12 other Spanish-speaking nations in Latin America with annual remittances of at least $500 million. Bolivia, El Salvador, Guatemala and Honduras had remittance drops during the recession years, but have recovered. Nicaragua, Paraguay and Peru did not have notable declines during the recession and totals have since risen. Argentina, Colombia, Costa Rica, Dominican Republic and Ecuador, like Mexico, have not recovered from remittance declines during the recession years. Data for the remaining nations (Chile, Panama, Uruguay and Venezuela), as well as for Brazil, and charts for each nation, can be found in Appendix A.
Remittances to Bolivia have risen steeply since 2000—the estimated total in 2013 ($1.3 billion) is more than seven times higher than in 2000 ($172 million). The growth (mainly before 2007) was sharper than for Latin America as a whole, and Bolivian remittances also differed from the pattern for Latin America overall by recovering from their decline during the Great Recession. Remittances to Bolivia generally rose to a peak of $1.2 billion in 2008, and then declined for two years before rising again. Remittances to El Salvador, which totaled $2.4 billion in 2000, rose to $4.2 billion in 2007 before drifting down and then up again. In 2013, El Salvador received an estimated $4.2 billion in remittances, about equal to its peak total. El Salvador remittances are mainly from the U.S., which was the source of 90% of that country’s remittances in 2012. Guatemala also receives most of its remittances—89% in 2012—from the U.S. Guatemalan remittances overall grew from $810 million in 2000 to $4.8 billion in 2008, about a sixfold increase. After declining in 2009, remittances to Guatemala have risen again since then, to total an estimated $5.4 billion in 2013, higher than the previous peak. Honduras, which received 87% of its remittances from the U.S. in 2012, also has recovered from a decline in remittances during the Great Recession. 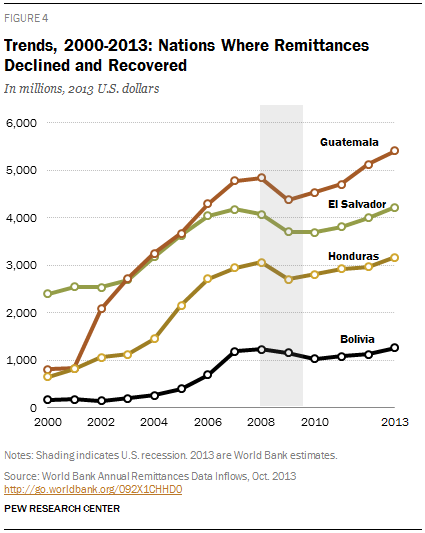 Honduras received $657 million in remittances in 2000, which rose to a peak of $3.1 billion in 2008. Remittances declined for a year before rising again; in 2013, they reached an estimated $3.2 billion. Remittances to Nicaragua have risen steadily since 2000, with only a slight dip during the Great Recession. 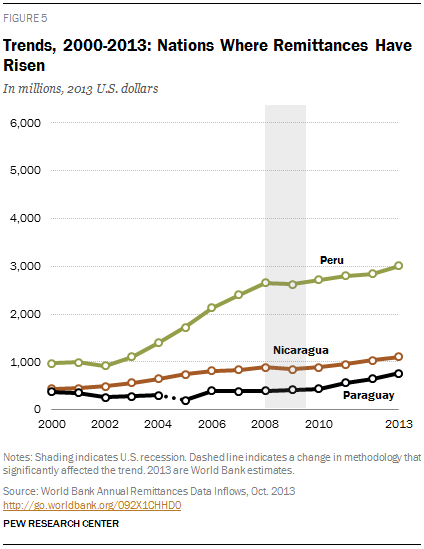 In 2000, $435 million in remittances were sent to Nicaragua, rising to $891 million in 2008. After a relatively small decline in 2009 (to $840 million), remittances began rising again. In 2013, they totaled an estimated $1.1 billion. Remittances to Paraguay, $378 million in 2000, grew to an estimated $760 million in 2013, according to World Bank data. Remittances declined or stayed about the same from 2001 to 2005 (although a change in World Bank methodology could have affected the trend; see text box on page 6). Remittances grew in 2006 and leveled off or grew slowly through 2010. Remittances grew rapidly after that; the estimated total of $760 million for 2013 is 73% higher than it was in 2010. In Peru, overall remittances grew from $975 million in 2000 to an estimated $3 billion in 2013. Remittances were relatively level from 2000 to 2002, grew to $2.7 billion in 2008, and remained level or grew through 2013. Over the 2000-2013 period, remittances to Argentina peaked in 2008, at $758 million, after rising each year before that, according to World Bank data. Since then, totals have been up and down. In 2013, estimated remittances of $613 million were about a fifth lower than at their recent peak but more than five times what they had been in 2000 ($117 million). Remittances to Colombia have followed a jagged pattern of rise and fall since 2000, when they totaled $2.2 billion. They rose from 2000 to 2003 and leveled off for two years before rising to a peak of $5.3 billion in 2008. Remittances to Colombia declined or leveled off from 2009 to 2012 before rising again to an estimated $4.6 billion in 2013. As explained in the next section, besides the U.S., a notable share of remittances to Colombia come from Venezuela and Spain, two economies that are still struggling. Remittances to Costa Rica, about two-thirds of which come from the U.S., rose sharply from 2000 ($185 million) to 2007 ($697 million). Remittance totals fell or leveled off after that until resuming their upward climb in 2012. In 2013, Bolivia received an estimated $610 million in remittances. In the Dominican Republic, which receives three-quarters of its remittances from the U.S., money sent home by migrants has grown by about half since 2000, when it totaled $2.5 billion. Remittances peaked at $3.9 billion in 2008, and have been up and down somewhat since then. In 2013, the Dominican Republic received an estimated $3.7 billion in remittances. Remittances to Ecuador totaled $1.8 billion in 2000, then rose to a peak of $3.8 billion in 2007 before falling or leveling off. In 2013, Ecuador received an estimated $2.6 billion in remittances, about a third lower than its peak total. Spain is the main contributor of remittances to Ecuador, followed by the U.S. Although yearly data showing U.S. remittances to Latin American nations has not been published, the Pew Research Center analyzed an unpublished World Bank database of U.S. remittances in 2005, two years before the start of the Great Recession. A comparison of 2005 to 2012 U.S. remittances shows that the total sent to Spanish-speaking Latin American nations rose 10% over the period in real terms, from $37.3 billion in 2005 to $41 billion in 2012. However, the change varied greatly among individual nations. U.S. remittances to Mexico—the largest destination country—declined slightly (3%) in real terms, from $23.6 billion in 2005 to $22.8 billion in 2012. 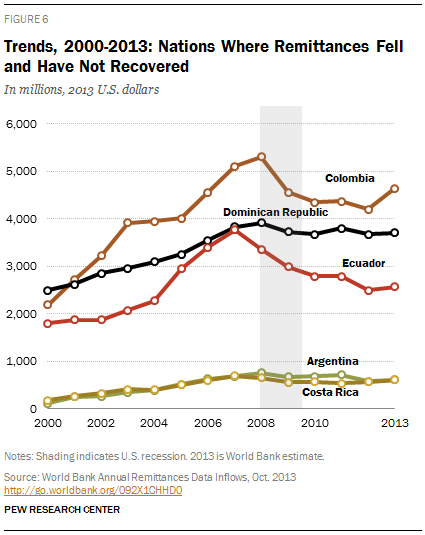 Remittances to Colombia fell 18% in real dollars from 2005 to 2012. However, among other countries with total remittances of $500 million or more, all had double-digit percentage increases in remittance growth from the U.S. since 2005. In three countries, the amount more than doubled: Bolivia (135%), Paraguay (119%) and Honduras (115%). U.S. remittances to Panama, which received 72% of its remittances from the U.S. in 2012, also grew sharply—by 181% between 2005 and 2012. As a result of these differing trajectories, there were changes in rank among the top 10 recipients of U.S. remittances. 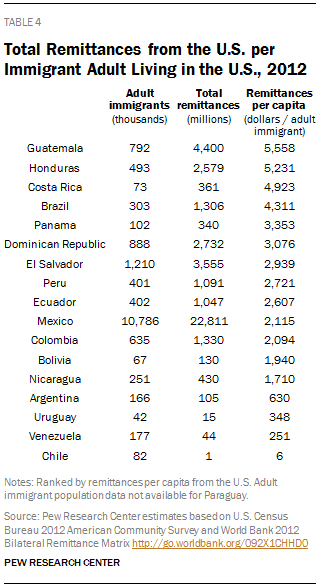 Honduras received more remittances in 2012 than Colombia, the reverse of their positions in 2005. Similarly, Peru received somewhat more than Ecuador in 2012 remittances, a reversal from 2005. Remittances are an important contributor to the economies of some Latin American nations. In 2012, according to World Bank data, remittances accounted for about 10% or more of GDP in four nations: El Salvador (16.5%), Honduras (15.7%), Guatemala (10%) and Nicaragua (9.7%). However, for most Latin American nations, remittances make up a far smaller share of GDP. In 2012, they amounted to less than 1% of GDP in Argentina, Chile, Uruguay and Venezuela. According to the World Bank (World Bank, 2013), remittances worldwide amount to nearly three times the size of foreign aid, or official development assistance. In Spanish-speaking Latin America, according to World Bank data for 2011 (the latest available), remittances ($53.1 billion) amount to more than eight times the total of foreign aid to the region ($6.2 billion). The size of the difference between remittances and foreign aid varies by nation. Remittances are about 34 times the amount of foreign aid in Nicaragua, and about 10 times or more foreign aid in Costa Rica, Dominican Republic, Ecuador and El Salvador. At the other end of the scale, remittances are less than twice foreign aid in Bolivia. In Chile and Peru, remittances are less than foreign aid. The total amount of remittances sent to each Latin American country from the U.S. is linked to the size of each country’s foreign-born adult population in the U.S. Likewise, the share of remittances to each country that comes from the U.S. is closely linked to the share of that nation’s emigrants who live in the U.S.
Mexico, with by far the largest adult population in the U.S. (10.8 million in 2012) received the largest total remittances.1 Guatemala, fourth-ranked in adult population, ranked second in total remittances. The Dominican Republic, third-ranked in adult population in the U.S., was the fourth-largest remittance recipient in 2012. However, the per capita amount of remittance sent home has less to do with population size in the U.S. Although Mexicans send home the largest total of remittances, they ranked ninth among 16 Spanish-speaking Latin American nations in remittances per capita in 2012. Similarly, Colombia ranked fifth in adult population size in 2012 but 10th in per capita remittances. Meanwhile, Costa Rica ranked 15th in adult population size in 2012 but third in per capita remittances. Guatemala, fourth-ranked in adult population size, sent home the highest per capita remittances in 2012. Honduras, ranked sixth for adult population, sent home the second-highest per capita remittance.